First field done, 4 fields to go. 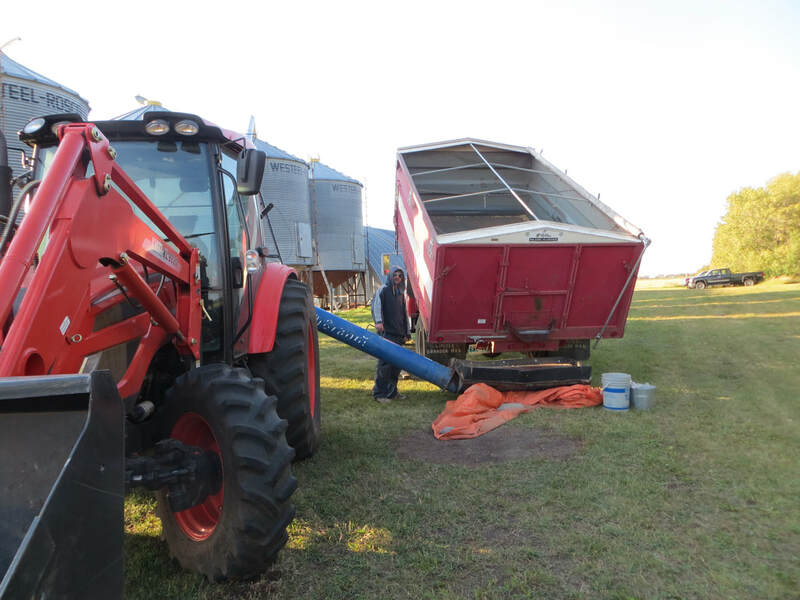 Grain tested 15.3% moisture today, which is a bit damp, but aeration fans on the storage bins will fix that. Maiden voyage with our newly acquired unit. Grain tested a bit damp (15.5% moisture), so all will be a go tomorrow! In some areas the wheat looks fabulous, in other areas, it is a bit weedy. This year the BIGGEST weed problems have been Canada Thistle, wild oats and some volunteer alfalfa. Most other little weeds were, for the most part, eliminated by the harrowing in July. The Plan to eradicate these pests is to work the ground after harvest is complete and spray apply GSR Dormant Calcium and softrock phosphate (both available from Back To Your Roots Soil Solutions Inc). The PLAN to combat Canada Thistles is to cut and bale them as hay for the grass fed beef. 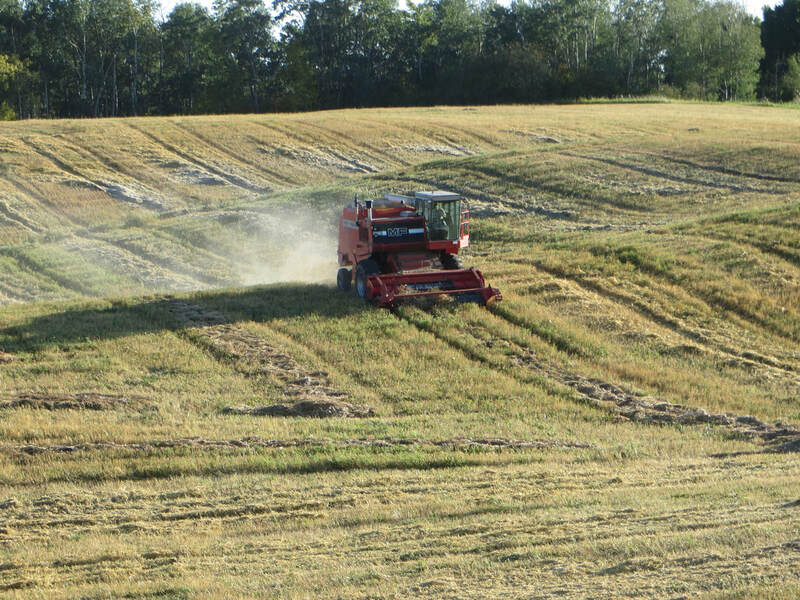 Once baled, the land will be worked (two-way disc) and calcium* will be sprayed on the land. Calcium softens the soil and changes the chemistry with the idea to make an environment where thistles simply do not want to grow. Mechanical methods might rid the area of thistles for a short period of time, but it doesn't change anything in the soil. Stay tuned to see how this works! The spring of 2018 was very dry. The first rain of the season came on May 24th (one inch or 25 mm). Before working (cultivating) the ground, there was not much volunteer growth (weeds nor last year’s crop). Seeding finished on May 21st. 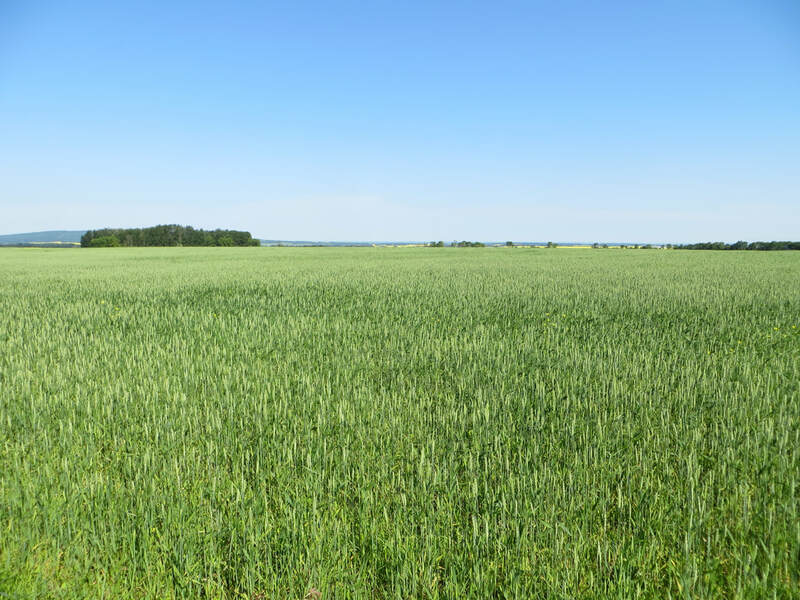 The first rain of the season on May 24th was very timely for the wheat, but also brought the weeds to life. 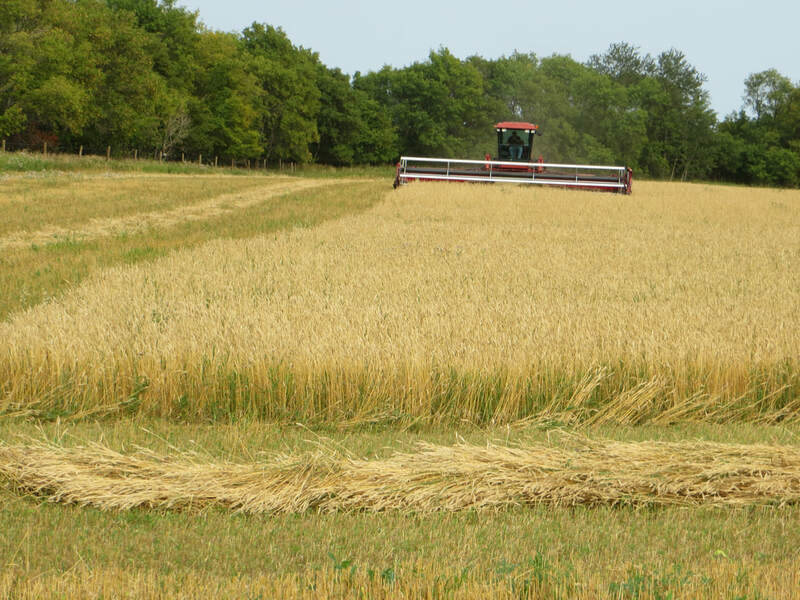 Since both the wheat and the weeds had the same start, the race for dominance was on. 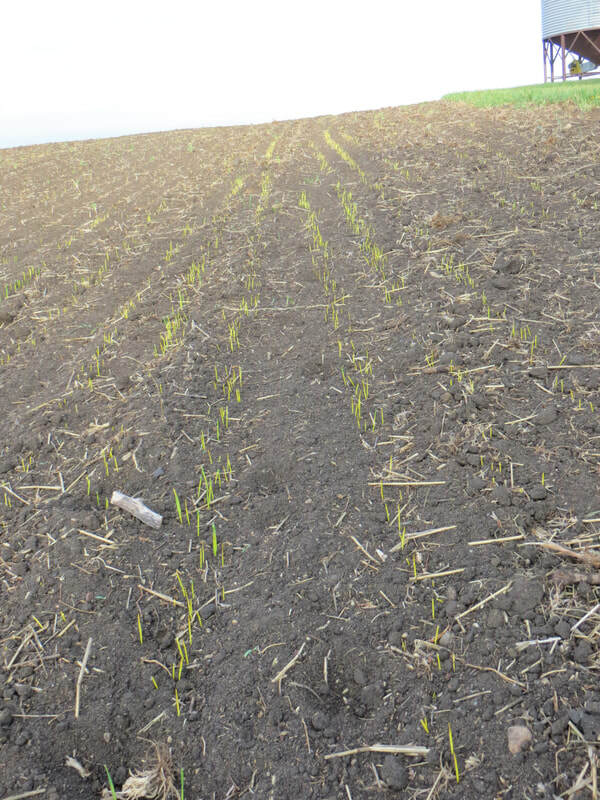 To knock back the weeds and ultimately assist the wheat, we harrowed the fields with diamond harrows on June 17 – 19th when the wheat was about 8 inches high. And it worked ...... even though the wheat was roughed up and set back a bit, the annual weeds definitely suffered, leaving the wheat to grow. 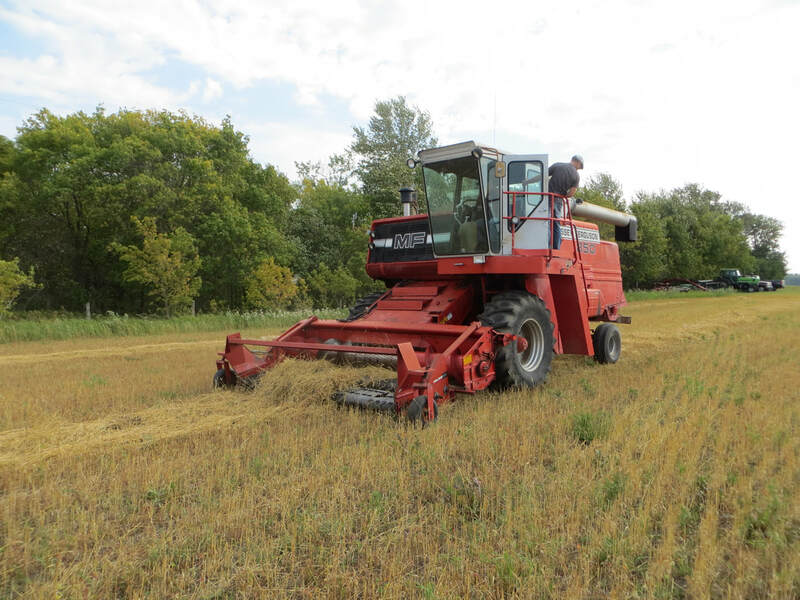 The harrowing was followed by a timely rain on June 22nd (2/10 inch or 5 mm). The wheat beats the weeds out of the ground. This picture taken 6 days after seeding. Preparing the ground for seeding. Lots of trash which adds to soil texture and fertility.